My grandmother taught me to knit when I was seven years old. You should have seen the scarf we made together: three tidy little rows at one end where she got me started and then a gnarly mess with undulating edges as I haphazardly added and lost stitches along the way. I still have that scarf and I wore it with pride. Over the years my knitting skills have improved somewhat, and I find deep joy in crafting a hand knit gift. Right now our coffee table is overflowing with books about knitting and sewing that I checked out from the library. I am trying to figure out these days if I would enjoy turning my love for knitting into a business. Eek! Yes. A business. Still in the "how am I going to do this??" stage, but now Elliott and I have been talking about this for weeks. Months. 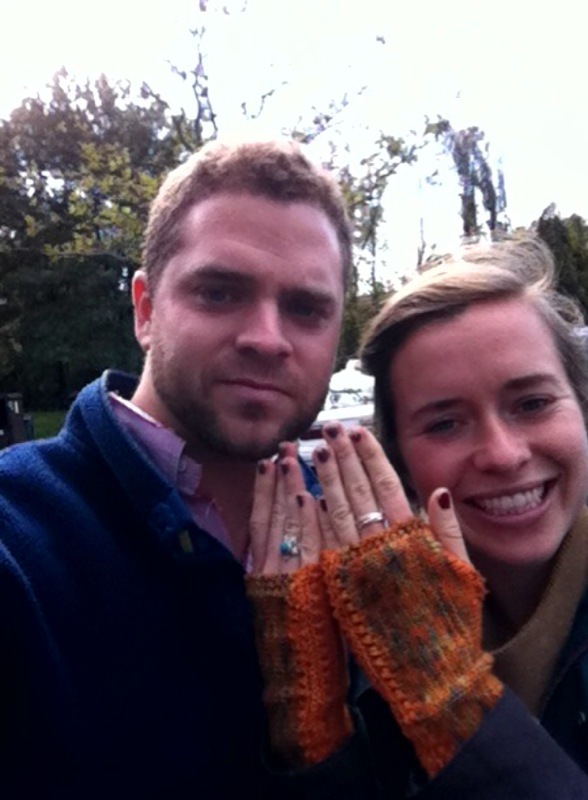 sideways fingerless gloves from fine Italian merino Garber siblings enjoying Charlottesville and new gloves! Recently I went on a fingerless-gloves-knitting-kick and made four pairs of gloves for friends and sisters-in-law. They love them! The orange and green gloves were made with the autumnal Blue Ridge in mind. I used a fine Italian merino wool called Ella Rae; it's my new favorite yarn and the colors are magnificent. The brown and pink gloves were made from a soft silk-merino blend and the product was delicate as well as toasty warm. Well, toasty warm in Texas, that is. The recipient of these gloves lives in Boston; I only hope they provide enough warmth! As I think about starting a business, I would love any tips or advice from other crafters out there. Also, if any of you are interested in commissioning me to knit a gift for one of your loved ones this Christmas, just send me an email at beccagarber@gmail.com. I'd be delighted to send pictures of other projects I've completed, including multiple baby items (sweaters, hats, booties) and projects large and small for adults or the home. Ever thought about selling on Etsy? There are some fees, but it's becoming a hip place to buy things. Might be worth checking out. Sarah Yates was wearing her gloves when she came to NYC last weekend. I commented how beautiful they were, and she said that you had made them. I am always amazed by your talents! Miss you! My soon to be sister in law started her own business making baby accessories such as blankets and pillows so maybe you could talk to her. Let me know if you want me to put you in contact. Thanks for the encouragement, Sarah! And Abi, yes, I'll email you about getting in touch with your almost-sister-in-law. I remember meeting her earlier this year at your confirmation and was amazed and inspired by her entrepreneurial spirit. Becca! This is so exciting! I stumbled upon your blog after doing my weekly checkup on Sarah Ham's. I think I know a baby or two who might have some cold feet, so keep me posted! Becca: I'd love to see what you can do for home items. Do you have a website?